Wafer thin porcelain veneers are applied to the fronts of your teeth to cover a variety of cosmetic issues. Although veneers may be thin, they're very strong. Because veneers are made from translucent porcelain, they look just like natural tooth enamel. 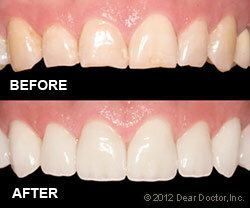 Veneers can be used to improve the appearance of one or two teeth, or all of them. They're a good choice if you're concerned about chipped or broken teeth or have a discoloration caused by a large filling, tetracycline stain or root canal treatment. Frequent grinding can wear down teeth and make them smaller than surrounding teeth. Whether you're concerned about tooth size or shape, veneers can help you achieve a more uniform smile. Veneers are also a good choice if you have gaps between your teeth or a few teeth are slightly crooked. Although severe issues may require orthodontia, veneers are a good choice for minor problems. Why are veneers better than teeth whitening? Teeth whitening is very effective at brightening your smile, but sometimes your teeth still aren't as white as you would like after treatment. With veneers, you choose the final shade of your teeth. Since veneers are stain-resistant, your teeth will stay white, even after you've worn them for years. If you whiten your teeth, foods and beverages can eventually stain them again. Veneers can also be custom-made to match your existing tooth color if you only need to cover chips or other issues on one tooth. Your Sherman Oaks dentist must remove a thin layer of enamel from the front surfaces of your teeth before you receive veneers. He'll then make an impression of your teeth, which a dental laboratory will use to create your veneers. You'll wear temporary veneers are until your permanent ones are ready in a week or two. When your new veneers arrive, your dentist will check the fit before applying them to your teeth with dental cement. Are you interested in natural-looking, beautiful Veneers? Call Guy A. Mangia, DDS in Sherman Oaks, California at (818)785-0750 to schedule an appointment and restore you smile!